Christmas Eve dawned officially at 7:44 this morning as the sun crept above the horizon on a clear, crisp, cloudless day. We watched the shadows ever-so-slowly slip down the tree line on the far side of the lake as the sun climbed higher and higher in the Eastern sky. It was going to be a beautiful day. Later, all bundled up against the –17C temperatures, I grabbed a camera and headed out to the mailbox to post a few straggling Christmas cards which, for some reason, go out later and later each year. Oh well, it’s the thought that counts, right? Walking down our road I’m struck by the complete quiet. While lots of chickadees and nuthatches are at the feeders, they are silent but for the flutter of tiny wings not heard at a distance of more than a few feet. Crows circling above have also lost their voice. The snow and the forest absorb all other sounds but for the crunch of my boots and the swish of my snow pants. The imagery is spectacular. The sky is that shade of deep blue you only get in the winter, the contrast making the snow even more brilliant – a purer white cannot be imagined. My eyes involuntarily squint to reduce the brightness as I regret leaving my sunglasses at home. Branches bending under the weight of recent freezing rains and snows arch across the road. Visually appealing, some will probably have to be cut to give access to the snow removal people. And everywhere, tracks in the fresh snow standing testament to a pack of coyotes hunting overnight. I wonder how a photograph could ever come close to capturing the sense of this day and the awe it instils, but still I take several. The peacefulness seems appropriate for Christmas Eve and the solitude encourages some quiet reflection as I walk. It’s been a good year, and while I’m not a religious person I feel blessed in so many ways. I have a loving family, good friends, good health (now that the ribs are healed), a nice place to live, and even a Harley in the garage. There’s a fire in the fireplace, fresh bread in the oven, and our daughter is coming home tonight to spend a few days with us. Life is good. And with that I wish all my readers a very Merry Christmas. May you enjoy the day tomorrow with friends and family whether sitting on an Australian beach, gathered around a bonfire in the great frozen north, or lounging in the shade of an Arizona saguaro. Peace be with you and yours. Whad’ya mean you want to put your car in the garage? I was checking out some of the latest mass-market cameras at Best Buy the other day. It had been quite a few years since I bought any new camera equipment (my Nikon D70, so that gives you an idea) and so I was quite amazed by the current offerings on sale and the progression in camera technology over those years. But that all changed with digital. The technology now allows us to take as many pictures as we want at no cost, and with no waiting. We can see right away if the picture is any good, delete those that aren’t, and perhaps still have an opportunity to retake a better image. The sniper shot that was the hallmark of the serious amateur has become a Gatling gun. Then some bright light decided that a good place to put a camera lens was in a telephone (I know, what could they have possibly been thinking?). Now anyone who has a cell phone is, by definition, a photographer as well. And so cameras are now ubiquitous. The technology is on computer monitors, laptops, in tablets, on cell phones, and the list goes on. And the really cool thing about much of the new technology is its tight integration into our wider technological sphere. You can post pictures directly from your smart phone or tablet camera to Facebook or MySpace, send them via email, or store them in one of the cloud-based services. Your camera has become an integral part of your internet. But for all that there was still a problem - device-based camera image quality could never match that of a purpose-built camera. 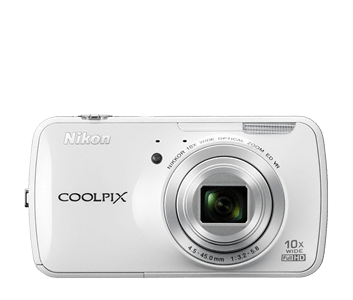 The Nikon Coolpix S800C is representative of the latest generation of ‘smart’ cameras. First and foremost a camera, design attention has been paid to image quality and usability as a camera. And then it has been loaded up with a nice screen and the Android operating system so it is also a smart device. Granted you’ll still need a phone, but for all the other features this little Nikon (or one like it – there are several competing products now or soon to be on the market) is well up the must have list for the semi-serious motorcycle photographer. Consider the benefits: small, pocket sized; no need to carry a tablet or laptop to share pictures with distant friends and family; you can check e-mail and browse the web through the built in Wi-Fi ; and play Angry Birds when waiting out a nasty thunder storm under a freeway overpass. I expect it won’t be long before someone adds voice (cell phone capability or perhaps a Skype-type interface) to a smart camera but I don’t think it’s worth waiting for that; this little beauty has everything I need for a convenient, compact travel cam. Now this looks like a terrific little gizmo for the gadget minded among us who tend to mislay items like keys, jackets, etc. But I do have one question: What if the thing you misplace most often is your smart phone? I haven’t decided yet, but I’m leaning towards contributing just to be first in line when production starts. Check it out at http://www.indiegogo.com/sticknfind. h/t to Bikes in the Fast Lane for the lead. Then, sitting back with a cigar in one hand and a drink in the other (benefits of having a heated garage), I thought about how we treat our vehicles. While there are some who view their bikes as just another mode of transportation that’s easier to park and cheap on gas I think for most of us it goes deeper than that. We develop a bond with the machine that is different than the relationships we have with our cars or trucks which, in stark contrast to the gleam on the bikes, are sitting outside covered in road salt and dirt – a description that will likely still apply in June. You often hear variations of the expression “the best bike I ever owned was the one I just sold” and I think that’s true, for a while. The feeling of regret and wondering if you did the right thing or not can be strong and lasting – until you develop a new relationship with your new ride. And if that doesn’t happen, if the chemistry just isn’t right with the new ride, we immediately begin to look for a replacement, always in search of that connection that is so fundamental to being able to enjoy life on two wheels. And no sooner do we have the paperwork in hand than we get busy customising the machine, overlaying our personality onto the bike and making it our own, creating something unique that we can fall in love with again and again and again. We don’t usually treat our 4-wheeled vehicles that way. Certainly there are car and truck owners out there who take pride in their rides and customize them accordingly, but for the most part we view them as tools or utility vehicles that allow us to get from point A to point B with a minimum of fuss and a modicum of comfort. Sure we’d like to be driving Porsches or Lamborghini's or even Cadillac Escalades, but those are just not in the cards for most of us. So we settle for “okay”, balancing budget (car payments or mortgage? ), utility (6 kids + 2 dogs ≠ Corvette), and personal bias (I’ll never buy a Chevy!) to come up with something practical. Then we wash it once a year (maybe), and drive it until the wheels fall off at which point we go looking for the next 4-wheeler to haul us and our assorted baggage around for the next 10 years. So why do we treat motorcycles differently? I suspect the reasons are as varied as the riders out there, but I think the main factor is one of intent. For most of us our motorcycles are our toys, our hobbies, the icing on the cake of life as it were. And as with any hobby we invest extra attention (and $$$) on them to entertain and amuse ourselves. Nobody wants to ride a stock black Harley around, but throw on some extra chrome, a bit of bling, and a functional do-dad or two and it’s now “my” black Harley and, by definition, an extension of “me”. Which is, as I think about it, probably not unlike the way custom car and hot rod guys view their toys as well. But that’s a whole other topic, so best to stop thinking and get back to polishing and being thankful this isn’t mine to keep clean. No that’s not just a dirty camera lens – that’s snow, big, fluffy, wet snow drifting down. We’ve been fortunate this year to have a relatively mild fall and a late freeze, extending the riding season well into November and even, if you hadn’t already stored your bike for the winter, into the first week of December. But it looks like our bonus time is up, and just in time for Christmas. Now I could quite happily live in a climate that was 80 degrees every day with evening lows of 70 or so, but such places are few and far between and seem to be mostly small islands that get wiped out every second or third hurricane season. The only other options seem to be places that are either too hot to ride in the summer or too cold or wet to ride in the winter, and I’m more or less stuck in the latter. But if I have to endure a few months of less than ideal riding conditions I would rather it be snow than rain. I know, I know, you don’t have to shovel rain, but the endless gray skies would drive me insane. Besides, you have to admit, it is pretty. Just when you thought you knew yourself…. A grizzled biker, all tattooed and leather clad, sat down at the local pub and ordered a pint. A little while later, a young man came in and sat down on the other side of the old guy. He looked him up and down and asked: "Are you a real biker?"